The Chick-fil-a Kickoff Game will be Saturday, September 5 at the Georgia Dome in Atlanta, pitting the University of Alabama against Virginia Tech. It will be televised nationally on ABC. On the Monday after the game (Labor Day, Monday, Sept. 7) from 10:30 AM to 8 PM, customers wearing any sports-related apparel to a Chick-fil-a restaurant will receive a free Chick-fil-a sandwich. Appropriate attire includes any article of clothing with a sports team logo – from a little league uniform to a favorite professional or collegiate jersey, hat, t-shirt, socks or other accessory. But that's not the only way to get a free Chick-fil-a sandwich. 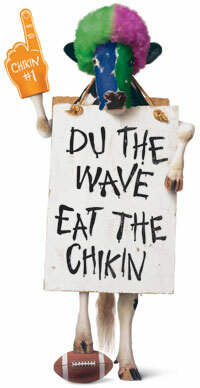 You can also go to www.ChickenWave.com and sign up to receive a coupon for a free Chick-fil-a Sandwich. The first 250,000 people to sign up get the free sandwich, the next 750,000 will get a coupon for a free Coke Zero. Plus there will be a daily drawing (8/24 to 10/31/09) for a $50 Chick-fil-a gift card.